Super great screen protector, and crystal clear! Thank you! Fast shipping, Secure packaging. Exactly as described. Thank you. Not perfect, but better than expected. 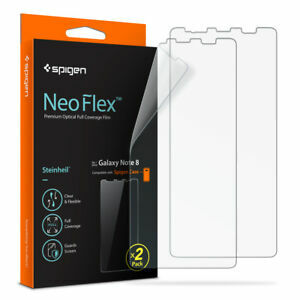 I bought this spigen screen protector to go with a spigen case. Application was super easy, there's still some air bubbles but im sure they'll go away after a day or two. Coverage is perfect, but depending on your application, your case may clip the edges of your screen protector and lift it slightly. Mine lifts at the top right corner. For less than $30 all together, I'm glad I chose this setup as opposed to the overpriced retail stores, and low quality off brands. I am a little disappointed in the product over all. It is not a clear finish when applied to the screen, you can see what is best described as a fish scale appearance. Plastic is very then, edges do not lay flat. Holes/cut out slots do not line up well and your finger catches at the tip while doing a slide down menu. I understand why they provide 2 films. I purchased 2 packs of these. One for my phone and one pack for my wife's phone. I will be looking for another product with better protection. Received quickly and in good condition. Watched installation video, as directed. Note, this is a "wet" application. In 5 minutes, I had a perfect edge to edge application. No bubbles, discoloration, or lifted edges/corners. My Spigen case was on for the initial application, but remained off overnight until the film had full adhesion. Very well designed. I'm impressed. Time will tell how it holds up to daily use. Touch response is perfect...better than the Spigen glass protector I removed (which broke...twice). One last thing, if you put this on crooked, you can peel it off, re-wet, and re-apply...very nice feature. Not the easiest thing to install but a spray solution and squeegee card was included to ear the process. Once installed and dried out it feels good to touch and doesn't hinder the screens sensitivity at all. There is however one major flaw. The s pen will leave impressions in the protector that can be easily seem under certain lighting conditions. Had my chance on this item. It is liquid applied and gives a nice protection on my Note8's screen. Though it does NOT cover the entire screen (the edges are slightly off protection). But it sure gives a great protection to my valuable Infinity Display! Not so smooth on the fingers but meh..it sure worths the money you pay for!